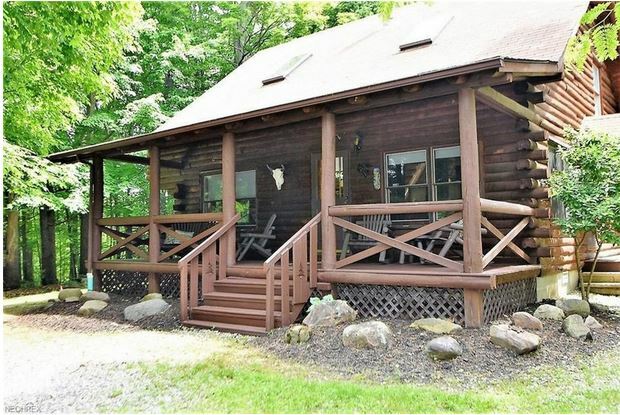 STREETSBORO, Ohio — If you’ve ever dreamt of living in a real log cabin in the woods, here’s one straight from the front of a syrup bottle or those Lincoln Logs you played with as a kid. Built in 1992 from Vermont Douglas Fir and pine timbers, the cabin has 3 bedrooms and 2 bathrooms in approximately 1,600 square feet. The asking price is $349,000. “Nestled down a tree line private road on seven-plus wooded acres with two open meadows,” Howard Hanna agent Karyl Morrison writes in her listing. “This fabulous property backs to a nature conservancy and borders Portage Parkland. Inside, you’ll find all the comforts of home with an open floor plan, family room with vaulted ceiling and wood-burning stove, cozy office and first-floor master suite. The upstairs features a loft with access to a balcony that brings you even closer to nature.